Researchers have made a filter capable of changing between a window and a mirror by finely tuning the distance between nanoparticles in a single layer. With the help of this development, Scientists will now be able to produce special materials whose optical properties can be modified in real time. Consequently, these materials could be used for applications ranging from tunable optical filters to miniature chemical sensors. It is difficult to create a ‘tunable’ material which can be controlled accurately, as it involves small scales. For tuning the optical properties of a single layer of nanoparticles – which are just tens of nanometers in size each – the space between them should be set uniformly and precisely. In order to form the layer, the group of Researchers from Imperial College London set conditions for gold nanoparticles to localize at the interface between two liquids that do not blend. 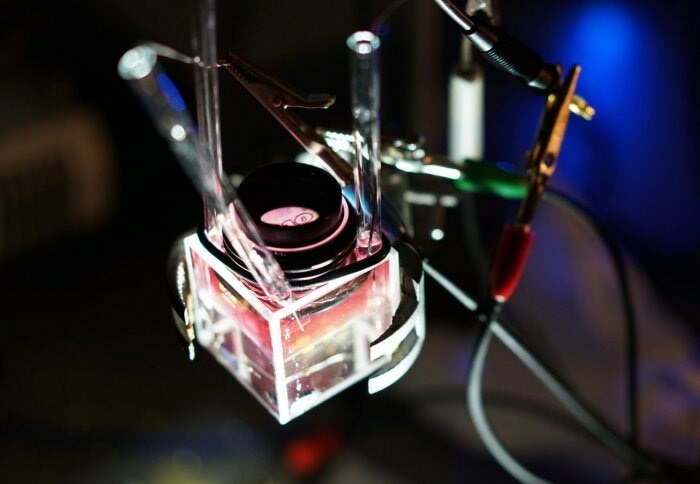 The team applied a small voltage across the interface, and hence revealed a tunable nanoparticle layer that can be sparse or dense, allowing for switching between a transparent surface and a reflective mirror. This study has been recently published in Nature Materials. It’s a really fine balance – for a long time we could only get the nanoparticles to clump together when they assembled, rather than being accurately spaced out. But many models and experiments have brought us to the point where we can create a truly tunable layer. From the distance between the nanoparticles, it can be determined whether the layer reflects or allows different wavelengths of light. At one extreme, where the layer acts as a mirror, all the wavelengths are reflected. At the other extreme, where the nanoparticles are dispersed, the layer acts as a window and all wavelengths are allowed through the interface here. The team’s electrical system is reversible, in contrast to previous nanoscopic systems in which the optical properties were varied using chemicals. Finding the correct conditions to achieve reversibility required fine theory; otherwise it would have been like searching for a needle in a haystack. It was remarkable how closely the theory matched experimental results. The video above shows the system in action. The layer first acts as a window onto a £10 note below, and then reflects the £1 coin above when a voltage is applied.